Approximate location of the Sunday morning carjacking. Carjackers shot a 47-year-old man in the Uptown neighborhood shortly before 11 o’clock on Sunday morning, police said. No one is in custody. 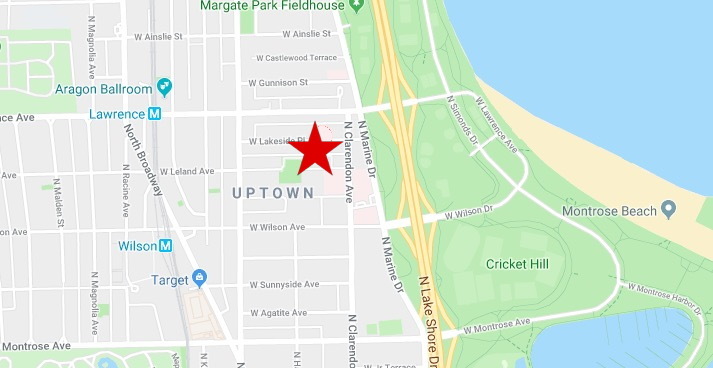 The victim, who lives in Uptown, was in the 800 block of West Leland when two men approached him and demanded his car at gunpoint, police said. When the victim tried to grab the gun, one of the carjackers began firing, striking the man in his right thigh. Both carjackers then got into the victim’s white 2015 Hyundai Elantra and sped away. They were last seen heading north on Clarendon Avenue, police said. A white 2015 Hyundai Elantra. A private ambulance driver who happened to be in the area gave the victim a ride to nearby Weiss Hospital where his condition was stabilized before being transferred to Advocate Illinois Masonic Medical Center. Police said the gunman was a black male with short hair who is in his 20’s, stands about 5’9” tall, and weighs about 165 pounds. He was wearing a blue tank top and blue jeans. The second man was black, 20-25 years old, 6’1” tall, and 180 pounds with short hair and a light beard. He wore blue jogging pants and was shirtless, but carried a white tank top, according to police. The stolen Elantra bears license plate AT89613.